The Associated Press reported that a private burial will follow the public memorial service, held at the campus of what was formerly the Crystal Cathedral but is now owned by the county's Roman Catholic diocese. In a Facebook message on Monday, the televangelist's grandson, Bobby Schuller, wrote: "For those who are clothed in Christ, dying feels more like waking up than falling asleep." Schuller died at the age of 88 on April 2, after a years-long battle with esophageal cancer. Bobby Schuller, who is now hosting the "Hour of Power" program and serves as lead pastor at Shepherd's Grove, the home of the Crystal Cathedral congregation, said in a statement following his grandfather's passing: "I have the incredible honor of carrying on my grandfather's legacy by teaching people that they are not what they do, not what they have, and not what people say about them. They are the beloved of God," he said. "This message is going to millions around the world as we carry on the work my grandparents and parents began exactly 60 years ago. The Hour of Power team is dedicated to keeping Schuller's legacy alive by providing our messages, old and new, to those who need to hear them most." 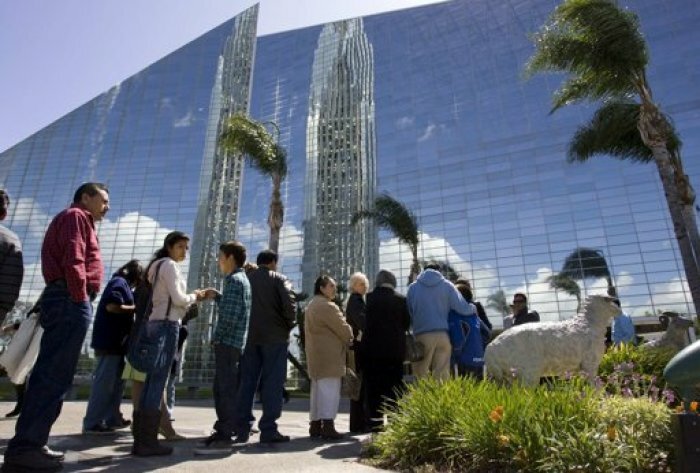 Crystal Cathedral was founded in 1951 by Schuller and his wife, Arvella. In 1970 Schuller founded the "Hour of Power" program, which increased his popularity around the world, reaching close to 20 million people in 180 different countries during its peak in the 1990s. The glass-paned church found itself straddled with debt by 2010, however, and filed for Chapter 11 bankruptcy, owing more than $7 million to its creditors. The Roman Catholic Diocese of Orange bought the megachurch for $57.5 million and renamed it Christ Cathedral, and is still working on reconstructing its design. Schuller's son, the Rev. Robert A. Schuller, recalled some fond memories of his father in an article for City News Service on Monday, including their shared passion for fishing. "We traveled the world together, looking for big fish, and we did quite well doing that," Schuller said. "When I went away to college we had a competition for the biggest fish. It bounced back and forth." As for the decision to hold his father's funeral at the former Crystal Cathedral, Schuller said it was an appropriate choice. "It's the only place to have it," he said.